Every so often, a piece of automotive history comes along that exemplifies perfection, elegance and significance that many try to attain, but few achieve. 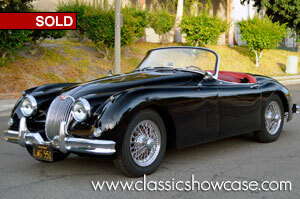 This is one of four special Jaguars from a private La Jolla, CA Jaguar collection. The Jaguar XK-150S presented here is a numbers-matching car that is not only one of the marque's most elegant Roadsters ever produced but is a highly desired example steeped in a rich history that separates it from the rest of the pack. With a great original color combination of a Black exterior over a Red interior, this overdrive-equipped 150S personifys the elegant style that is part of the vintage Jaguar experience. It is 1 of approximately 888 examples produced. The 'S' designates this car as a Special Equipment Model with twin exhaust and wire wheels. Special equipment extras included a dual exhaust system and square-pad disc brakes. Recently, this 150 S has been serviced and fitted with a new stainless-steel exhaust system, new tires, along with a full professional vehicle servicing by Jaguar specialists. In November of 1959 this XK-150 was dispatched from Jaguar Cars in New York although the 1st owners name is not recorded, the 2nd owner was James F. Lewis in Bonita, CA who had it from November 1965 until October of 1981. Changing hands again, it stayed in CA and went to Marilyn & Randy Prine of San Diego, CA until July of 2016. Finally settling in with its current owners, two Jaguar collectors in La Jolla, CA who have an extensive Jaguar collection. Included in the purchase is the 2 sets of keys, a jack, rachet, grease gun, partial tool kit, church key, original owner’s manual, and the original steering wheel. This unmolested original 150 S is a very good candidate to take to a higher level or can be driven and enjoyed as is. Production of the Jaguar XK-150 began in the spring of 1957 and would become the last of the tradition 1950s Jaguars. Although similar in appearance to the XKE cars it was replaced, it was certainly a different machine. It retained the same basic chassis, engine, and Moss four-speed gearbox, but its outward appearance was different and wider and there was more interior room for the occupants. Four inches were added to the center of the body making the extra width possible. A one-piece wraparound windscreen improved visibility. The radiator grille was changed slightly. The biggest improvement to the vehicle’s performance was the addition of Dunlop disc brakes on all four corners of the car. The XK-150 produced the same amount of horsepower as the XK140, so their performance was identical in terms of speed. The SE option added a modified cylinder head and larger exhaust valves which increased the standard 190 hp to 210. In 1958 the Model S was introduced which raised the vehicles performance even further. With the help of three two-inch SU HD8 carburetors, a Weslake-developed cylinder head, and high compression pistons, horsepower rose to an impressive 250 brining the zero-to-sixty time in just over seven seconds. All the XK-150s were offered with an optional Borg-Warner automatic gearbox and a choice of either steel or wire wheels. On the S Model, a limited-slip differential could be ordered as optional equipment. There were 2265 examples of the XK-150 Roadster produced with only 888 being the highly-sought after Model S.